What Do You Know For Sure? (1 John 5:6–21) | Joe Quatrone, Jr. The life that is real is built on the divine certainties that are found in Jesus Christ. The world may accuse the Christian of being proud and dogmatic, but this does not keep him from saying, “I know!” In these closing verses of John’s letter, we find five Christian certainties on which we can build our lives with confidence. In 1 John 5:1–5, emphasis is placed on trusting Jesus Christ. A person who trusts Christ is born of God and is able to overcome the world. To believe Jesus Christ is the Son of God is basic to Christian experience. But how do we know Jesus is God? Some of His contemporaries called Him a liar and a deceiver (Matt. 27:63). Others have suggested He was a religious fanatic, a madman, or perhaps a Jewish patriot who was sincere, but sadly mistaken. The people to whom John was writing were exposed to a popular false teaching that Jesus was merely a man on whom “the Christ” had come when Jesus was baptized. On the cross, “the Christ” left Jesus and so He died like any other human being. John refutes this false teaching and tells us Jesus is God. People often say, “I wish I could have faith!” But everybody lives by faith! All day long, people trust one another. They trust the doctor and the pharmacist; they trust the cook in the restaurant; they even trust the person driving in the other lane on the highway. If we can trust men, why can we not trust God? To not trust God is to make Him a liar! Jesus is God: this is the first Christian certainty and it is foundational to everything else. “I write these things to you who believe in the name of the Son of God, so that you may know you have eternal life” (5:13). Eternal life is a gift; it is not something we earn (Jn. 10:27–29; Eph. 2:8–9). This gift is a Person—Jesus Christ. We receive eternal life not only from Christ, but in Christ. “Whoever has the Son has life; whoever does not have the Son of God does not have life” (5:12). This gift is received by faith. 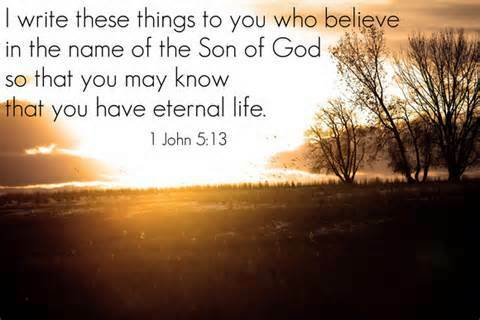 God has gone on record in His Word as offering eternal life to those who will believe on Jesus Christ. Millions of Christians have proved that God’s record is true. To not believe it is to make God a liar and if God is a liar, nothing is certain. God wants His children to know they belong to Him. John was inspired by the Spirit to write his Gospel to assure us that “Jesus is the Christ, the Son of God” (Jn. 20:31). He wrote this epistle so we may be sure we are the children of God (5:13). “Everyone who practices righteousness is born of Him” (1 Jn. 2:29). “No one who is born of God practices sin” (1 Jn. 3:9). “We know we have passed from death to life because we love the brethren” (1 Jn. 3:14). “Let us love one another, for love comes from God. Everyone who loves has been born of God and knows God.” (1 Jn. 4:7). “Everyone born of God overcomes the world” (1 Jn. 5:4). If you bear these “birthmarks,” you can say with confidence you are a child of God. It is one thing to know Jesus is God and that we are God’s children, but what about the needs and problems of daily life? Jesus helped people when He was here on earth; does He still help them? Earthly fathers take care of their children; does the heavenly Father respond when His children call on Him? Christians have confidence in prayer, just as they have confidence as they await the judgment (1 Jn. 2:28; 4:17). As we have seen the word confidence means “freedom of speech.” We can come to the Father freely and tell Him our needs. Of course, there are conditions we must meet. First, we must have a heart that does not condemn us (1 Jn. 3:21–22). Unconfessed sin is a serious obstacle to answered prayer (Ps. 66:18). It is worth noting that differences between a Christian husband and his wife can hinder their prayers (1 Pet. 3:1–7). If there is anything between us and any other Christian, we must settle it (Matt. 5:23–25). Unless a believer is abiding in Christ, in love and obedience, his prayers will not be answered (Jn. 15:7). Second, we must pray in God’s will. “Your will be done” (Matt. 6:10). Prayer is a mighty instrument, not for getting man’s will done in heaven, but for getting God’s will done on earth. Prayer is not overcoming God’s reluctance. It is laying hold of God’s willingness. There are times when we can only pray, “Not my will, but Yours be done” because we simply do not know God’s will in a matter. But most of the time we can determine God’s will by reading the Word, listening to the Spirit (Rom. 8:26–27), and discerning the circumstances around us. Our very faith to ask God for something is often proof that He wants to give it (Heb. 11:1). There are many promises in the Bible that we can claim in prayer. God has promised to supply our needs (Phil. 4:19)—not our greeds! If we are obeying His will and really need something, He will supply it in His way and in His time. “But if it is God’s will for me to have a thing, then why should I pray about it?” Because prayer is the way God wants His children to get what they need. God not only ordains the end, but He also ordains the means to the end—prayer. The more you think about it the more wonderful this arrangement becomes. Prayer is really the thermometer of the spiritual life. God has ordained that I maintain a close walk with Him if I expect Him to meet my needs. John does not write, “We might have the requests,” but, “We know we have the requests” (5:15). The verb is present tense. We may not see the answer to a prayer immediately, but we have inner confidence that God has answered. This confidence, or faith, is “the evidence of things not seen” (Heb. 11:1). It is God witnessing to us that He has heard and answered. What breathing is to a physical man, prayer is to a spiritual man. If we do not pray, we will faint (“give up”) (Lk. 18:1). Prayer is not only the utterance of the lips; it is also the desire of the heart. “Pray without ceasing” (1 Thes. 5:17) does not mean that a Christian is always saying an audible prayer. We are not heard for our many words (Matt. 6:7). No, “Pray without ceasing” suggests the attitude of the heart as well as the words of the lips. A Christian who has his heart fixed on Christ and is trying to glorify Him is praying constantly even when he is not conscious of it. Spurgeon dozed off and in his sleep began to preach the sermon that was giving him so much trouble! His wife wrote down what he said and the next morning gave her preacher-husband the notes. “Why, that’s exactly what I wanted to say!” exclaimed the surprised preacher. The message had been in his heart; it had simply needed expression. So it is with prayer: if we are abiding in Christ the very desires of our heart are heard by God whether we voice them or not. The pages of the Bible and the pages of history are filled with reports of answered prayer. Prayer is not spiritual self-hypnosis; we do not pray because it makes us feel better. We pray because God has commanded us to pray and because prayer is the God-appointed means for a believer to receive what God wants to give him. Prayer keeps a Christian in the will of God and living in the will of God keeps a Christian in the place of blessing and service. We are not beggars; we are children coming to a wealthy Father who loves to give His children what they need. While He was God in the flesh, Jesus depended on prayer. He lived on earth, as we must, in dependence on the Father. He arose early in the morning to pray (Mk. 1:35), though He had been up late the night before healing the multitudes. He sometimes spent all night in prayer (Lk. 6:12). In the Garden of Gethsemane, He prayed with “fervent cries and tears” (Heb. 5:7). On the cross, He prayed three times. If the sinless Son of God needed to pray, how much more do we? The most important thing about prayer is the will of God. We must take time to ascertain what God’s will is in a matter, especially searching in the Bible for promises or principles that apply to our situation. Once we know the will of God, we can pray with confidence and then wait for Him to reveal the answer. “Anyone born of God does not practice sin” (5:18). Occasional sins are not here in view, but habitual sins, the practice of sin. Since a believer has a new nature (“God’s seed,” 1 Jn. 3:9), he has new desires and appetites, and is not interested in sin. A Christian faces three enemies, all of which want to lead him into sin: the devil, the world, and the flesh. Our first enemy is the devil. The world “is under the control of the evil one” (5:19), Satan—“the god of this age” (2 Cor. 4:3–4) and “the prince of this world” (Jn. 14:30). He is the spirit who works in “the children of disobedience” (Eph. 2:2). Satan has many devices for leading a believer into sin. He tells lies, as he did to Eve (Gen. 3; 2 Cor. 11:1–3), and when men believe his lies they turn away from and disobey God’s truth. Or, Satan may inflict physical suffering, as he did with Job and Paul (2 Cor. 12:7–9). In David’s case, Satan used pride as his weapon; he urged David to number the people and in this way defy God (1 Chron. 21). Satan is like a serpent who deceives (Rev. 12:9) and a lion who devours (1 Pet. 5:8–9). He is a formidable enemy. Our second enemy is the world (1 Jn. 2:15, 17). It is easy for us to yield to the lust of the flesh, the lust of the eyes, and the pride of life! The atmosphere around us makes it hard for us to keep our minds pure and our hearts true to God. Our third enemy is the flesh: the old nature we were born with and which is still with us. True, we have a new nature (the divine seed, 1 Jn. 3:9) within us, but we do not always yield to our new nature. Then how does a believer keep from sinning? 1 John 5:18 gives the answer: Jesus Christ keeps the believer, so the enemy cannot get his hands on him. “He [Christ] who was born of God keeps the believer safe and the evil one cannot harm him.” Of course, it is true a Christian must keep himself in the love of God (Jude 21), but it is not true he must depend on himself to overcome Satan. Peter’s experience with Satan helps us to understand this truth. “Simon, Simon, Satan has asked to sift all of you as wheat. But I have prayed for you, Simon, that your faith may not fail. And when you have turned back, strengthen your brothers” (Lk. 22:31–32). To begin with, Satan cannot touch any believer without God’s permission. Satan wanted to sift all the disciples and Jesus gave him permission. But Jesus prayed especially for Peter and His prayer was answered. Peter’s faith did not ultimately fail, even though his courage failed. Peter was restored and became a mighty and effective soul-winner. Whenever Satan attacks us, we can be sure God gave him permission. And if God gave him permission, He will also give us power to overcome because God will never permit us to be tested above our strength (1 Cor. 10:13). One of the characteristics of “spiritual young men” is their ability to overcome the evil one (1 Jn. 2:13–14). Their secret? “The Word of God abides in them.” Part of the armor of God is the sword of the Spirit (Eph. 6:17) and this sword overcomes Satan. When a believer sins, he can confess his sin and be forgiven (1 Jn. 1:9), but a believer dare not play with sin because sin is “lawlessness” (1 Jn. 3:4). A person who practices sin proves he belongs to Satan (1 Jn. 3:7–10). God warns that sin can lead to physical death! While “all unrighteousness is sin,” some sin is worse than other sin. All sin is hateful to God and should be hateful to a believer, but some sin is punished with death. John tells us (5:16–17) about the case of a brother (a believer) whose life was taken because of sin. The Old Testament also mentions people who died because of their sin. Nadab and Abihu, the two sons of Aaron the priest, died because they deliberately disobeyed God (Lev. 10:1–7). Korah and his clan opposed God and died (Num. 16). Achan was stoned because he disobeyed Joshua’s orders from God at Jericho (Josh. 6–7). A man named Uzzah touched the ark and God killed him (2 Sam. 6). To whom much is given, much is required. A believer today has a far greater responsibility to obey God than did the Old Testament saints. We have a complete Bible, we have the full revelation of God’s grace, and we have the Holy Spirit living within us to help us obey God. There are also cases in the New Testament of believers who lost their lives because they disobeyed God. Ananias and Sapphira lied to God about their offering and they both died (Acts 5:1–11). Some believers at Corinth died because of the way they had acted at the Lord’s Supper (1 Cor. 11:30). 1 Corinthians 5:1–5 suggests a certain offender would have died had he not repented and confessed his sin (2 Cor. 2:6–8). If a believer does not judge, confess, and forsake sin, God must chasten him. This process is described in Hebrews 12:1–13, which suggests a person who does not subject himself to the Father will not live (Heb. 12:9). In other words, first God “spanks” his rebellious children, and if they do not yield to His will, He may remove them from the world lest their disobedience lead others astray and bring further disgrace to His name. “The sin unto death” is not some one specific sin. Rather, it is a kind of sin—it is the sort of sin that leads to death. With Nadab and Abihu, it was their presumption in taking the priest’s office and entering the holy of holies. In the case of Achan, it was covetousness. Ananias and Sapphira were guilty of hypocrisy and even lying to the Holy Spirit. If a Christian sees a brother committing sin, he should pray for him (5:16), asking that he confess his sin and return to fellowship with the Father. But if in his praying, he does not sense he is asking in God’s will (as instructed in 1 Jn. 5:14–15), then he should not pray for the brother. “So do not pray for this people, nor offer any plea or petition for them; do not plead with me, for I will not listen to you” (Jer. 7:16). James 5:14–20 somewhat parallels 1 John 5:16–17. James describes a believer who is sick, possibly because of his sin. He sends for the elders, who come to him and pray for him. The prayer of faith heals him and if he has sinned his sins are forgiven. “The prayer of faith” is prayer in the will of God, as described in 1 John 5:14–15. It is “praying in the Holy Spirit” (Jude 20). Christians do not deliberately practice sin. They have the divine nature within; Jesus Christ guards them, and they do not want God’s discipline. Jesus Christ is the true God. We know Him who is true and we are in Him who is true. We have the real thing! “We know that the Son of God has come and has given us understanding, so that we may know Him who is true. And we are in Him who is true by being in His Son Jesus Christ. He is the true God and eternal life” (5:20). Reality has been the theme throughout John’s letter and now we are reminded of it again. John was probably writing to believers in the city of Ephesus, a city given over to the worship of idols. The temple of Diana, one of the wonders of the ancient world, was located in Ephesus, and the making and selling of idols was one of the chief occupations of the people there (Acts 19:21–41). Surrounded by idolatry, Christians there were under tremendous pressure to conform. “We know there is no such thing as an idol in the world and there is no God but one” (1 Cor. 8:4). In other words, an idol has no real existence. The tragedy of idolatry is that a dead image can do a worshiper no good because it is not genuine. Hebrew writers in the Old Testament called idols “nothings, vain things, vapors, emptiness.” An idol is a lifeless, useless substitute for the real thing. The Psalms contain caustic indictments of idolatry (Ps. 115:1–8; 135:15–18). To human vision, an idol looks real—eyes, ears, mouth, nose, hands, feet—but these are useless imitations of the real thing. The eyes are blind, the ears are deaf, the mouth is silent, the hands and feet are paralyzed. But the real tragedy is that “those who make them will become like them, and so will all who trust in them” (Ps. 115:8). We become like the god we worship! This is the secret of the life that is real. Since we have met the true God, through His Son Jesus Christ, we are in contact with reality. Our fellowship is with a God who is genuine. As we have seen the word “real” means “the original as opposed to a copy” and “the authentic as opposed to an imitation.” Jesus Christ is the true Light (Jn. 1:9), true Bread (Jn. 6:32), true Vine (Jn. 15:1), and Truth itself (Jn. 14:6). He is the Original; everything else is a copy. He is authentic; everything else is only an imitation. Christians live in an atmosphere of reality. Most unsaved people live in an atmosphere of pretense and sham. Christians have been given spiritual discernment to know the true from the false, but the unsaved do not have this understanding. Christians do not simply choose between good and bad; they choose between true and false. An idol represents that which is false and empty; and a person who lives for idols will himself become false and empty. Few people today bow to idols of wood and metal. Nevertheless, other idols capture their attention and affection. Covetousness, for example, is idolatry (Col. 3:5). A man may worship his bankbook or his stock portfolio just as fervently as a so-called heathen worships his ugly idol. “Worship the Lord your God and serve Him only” (Matt. 4:10). The thing we serve is the thing we worship! Whatever controls our lives and “calls the signals” is our god. This explains why God warns us against the sin of idolatry. Not only is it a violation of His commandment (Ex. 20:1–6), but it is a subtle way for Satan to take control of us. When “things” take God’s place in our lives, we are guilty of idolatry. This means we are living for the unreal instead of for the real. To a man of the world the Christian life is unreal and the worldly life is real. This is because a man of the world lives by what he sees and feels (things) and not by what God says in His Word. An idol is a temporal thing, Jesus Christ is eternal God. “So we fix our eyes not on what is seen, but on what is unseen, since what is seen is temporary, but what is unseen is eternal” (2 Cor. 4:18). Like Moses, a Christian “endures because he saw Him who is invisible” (Heb. 11:27). Faith is “the evidence of things not seen” (Heb. 11:1). Noah had never seen a flood, yet by faith he “saw” it coming and did what God told him to do. Abraham “saw” a heavenly city and country by faith, and was willing to forsake his own earthly home to follow God. All of the great heroes of faith named in Hebrews 11 accomplished what they did because they “saw the invisible” by faith. In other words, they were in contact with reality. The world boasts of its enlightenment, but a Christian walks in the real light because God is light. The world talks about love, but it knows nothing of the real love which a Christian experiences because “God is love.” The world displays its wisdom and learning, but a Christian lives in truth because “the Spirit is truth.” God is light, love, and truth; and these together make a life that is real. “But it makes no difference what a man believes so long as he is sincere!” This popular excuse hardly needs refutation. Does it make any difference what the pharmacist believes, or the surgeon, or the chemist? It makes all the difference in the world! A Christian has “turned to God from idols to serve the living and true God” (1 Thes. 1:9). Idols are dead, but Christ is the living God. Idols are false, but Christ is the true God. This is the secret of the life that is real! * This concludes our study of the Apostle John’s first letter. I hope you have enjoyed and benefited from this series. God bless! This entry was posted in Book of 1 John and tagged Assurance, Bible, Confidence, Eternal Life, Faith, Jesus, Prayer, Salvation, Truth. Bookmark the permalink. This is so timely. Here are my thoughts on your Lesson. Prayer is a relationship with God. Prayer is our thoughts, our reading, our searching, our requests for others and ourselves, our walk with Jesus, who walked with us. There is only one who calls us His own, and understands us and loves us as His child. That One is the Alpha and Omega, and we obey Him because we love Him. Very true indeed, Rita. God bless! I agree Brother Anthony, if we have to make ourselves pray, then it is not by The Spirit and as we can see below this is how we are to always pray. This is the same as having Love for God and others, if we have to make ourselves it is not of the Spirit and will be shown in our actions even if we our words claim differently. Love is not just a word it is an Action. 2 Corinthians 1:3 Blessed be God, even the Father of our Lord Jesus Christ, the Father of mercies, and the God of all comfort; Who comforteth us in all our tribulation, that we may be able to comfort them which are in any trouble, by the comfort wherewith we ourselves are comforted of God. A soldier, A warrior well equipped, fully armored, in the heat of battle stricken, wounded, blinded, with his finger on the trigger of his weapon fires blindly at friends and enemies alike. Not because he means to but because he was caught in the moment about to pull the trigger before the mortar flash and explosion and the shrapnel ripping into the flesh. In that moment he doesn’t distinguish between friends and enemies…he shoots blindly. Are you referring to you Brother Anthony? No Brother Anthony, I was not thinking it was you or anyone else, I was just asking because I didn’t know who you were referring to. Duly noted, no offense taken. I am reminded of this verse as I stepped out back to pray…and it lingered with me. I do not possess vast Bible knowledge, though some might think so, I am given what is needed as needed and I can trust fully in that. Do you not see Pastor, every Christian should know these things. So are we to only preach to the choir…be heard and irriterate verbatim what is posted here. Nobody preaches the dangers anymore…not politically correct, n’cest ce-pas? People need to heed these words, this is a real imminent, clear and present danger! I understand prayer and if the reader didn’t The Pastor has explained it thoroughly here. I have seen prayer at work, the hand of a “Master Craftsman” healing, something beyond comprehension, humbling, awe-inspiring. If one moves forward in prayer but doesn’t heed the dangers up ahead, as you’ve pointed out, it “availeth” not. The prayer of a righteous man availeth much then what is to be said for the prayers of one “self” righteous and that is the danger of “self hypnosis”. A very real danger and not to be taken lightly. Excellent thought provoking offering P.J.Q. Pingback: What Do You Know For Sure? Part 2 (1 John 5:6–21) | Pastor Joe Quatrone, Jr. There is a “wonder-child” within us all, that must be reclaimed in order for faith to be fully realized. I have no doubt Pastor Joe that Jesus Christ is God, as the Scriptures confirm He is part of The Godhead or Trinity as we call Them today, they are 3 in One Spirit, meaning they have the same seed or Nature, they are Love and Love cannot do evil or sin but they have different roles as we can see below, God The Father is in Total Authority. 1 Corinthians 15:27-28 For He (God The Father) hath put all things under His ( Jesus Christ) feet. But when He (God The Father) saith all things are put under Him ( Jesus Christ) it is manifest that He (God The Father) is excepted, which did put all things under Him (Jesus Christ). And when all things shall be subdued unto Him (Jesus Christ), then shall the Son also Himself (Jesus Christ ) be subject unto Him (God The Father) that put all things under Him (Jesus Christ) that God (The Father) may be all in all. When God ( Jesus Christ) came to earth He was conceived by The Holy Spirit, God cannot die He is Spirit, that is why Jesus was born in the flesh of a woman and to Redeem us He had to die as a man and be resurrected so we could be too, He was the Firstfruit but being Christ in the flesh He defeated death our sins were paid for in His death and so death could not keep Him down because He was King of Kings (He wore a Golden Crown). Good and evil cannot co exist that is why Jesus was separated from The Father on the cross and so cried out Father why has thou forsaken me, He was laden down with our sins, He had to die as a man so He could be glorified in the flesh, so we can be too. You will find what I have shared is confirmed in the Scriptures below and we see it clearly in this verse that Jesus became man. 1 Corinthians 15:12 -29 Now if Christ be preached that He rose from the dead, how say some among you that there is no resurrection of the dead? But if there be no resurrection of the dead, then is Christ not risen: And if Christ be not risen, then is our preaching vain, and your faith is also vain. Yea, and we are found false witnesses of God; because we have testified of God that He raised up Christ: whom He raised not up, if so be that the dead rise not. For if the dead rise not, then is not Christ raised: And if Christ be not raised, your faith is vain; ye are yet in your sins. Then they also which are fallen asleep in Christ are perished. If in this life only we have hope in Christ, we are of all men most miserable. But now is Christ risen from the dead, and become the firstfruits of them that slept. For since by man came death, by man came also the resurrection of the dead.For as in Adam all die, even so in Christ shall all be made alive. But every man in his own order: Christ the firstfruits; afterward they that are Christ’s at his coming. Then cometh the end, when he shall have delivered up the kingdom to God, even the Father; when he shall have put down all rule and all authority and power. For he must reign, till he hath put all enemies under his feet. The last enemy that shall be destroyed is death. For he hath put all things under his feet. But when he saith all things are put under him, it is manifest that he is excepted, which did put all things under him.And when all things shall be subdued unto him, then shall the Son also himself be subject unto him that put all things under him, that God may be all in all. Else what shall they do which are baptized for the dead, if the dead rise not at all? why are they then baptized for the dead? Take care Pastor Joe , I wish for you in Christ Jesus God’s Love and His wisdom, ask and receive. I don’t have a title for this piece I’ve just written, but it speaks to the many things discussed in this posting. it manifested so quickly and I did not want to lose any of it…I will post it in a few minutes, whatever time it takes to type what has been frantically scribbled across four pages. It will be there if you care to read or perhaps I should post it here. These exchanges are very revealing and a blessing, being real with one another…this is “Church” in earnest. I am very happy and humbled to witness this and be a part of it!